Located 65 kilometers to the southeast of Guilin, Yangshuo is an ancient town which became a county in Jin Dynasty some 1500 years ago. Yangshuo is famous not only for the attractive hills and waters there, but also for its abundant produce, particularly for such fruits as sweet orange, tangerine, pomelo and persimmon. Chestnuts which produced in Yangshuo are also well known for their excellent quality. Xingping is an ancient town with a history of more than 1300 years. 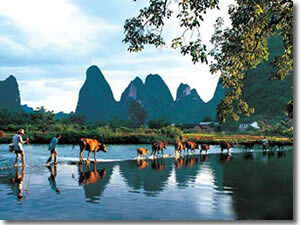 It is also an area where the best scenic sights along the Li River are to be found. There are such enchanting scenes as “Pretty Woman Looking in the Mirror”, “General Drawing His Sword” and “Carp Drinking from the River”. A S-shaped tiny street runs through the town, the only one in the town, called West Street, so named for many of the inhabitants along the street are foreigners. In the street, you want go around without coming across a foreigner. Small shops and stalls selling art crafts, souvenirs, and local specialties line the street. 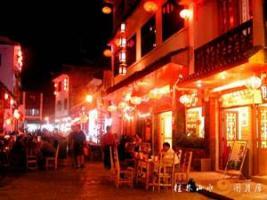 Yangshuo is actually one of the best places for shopping cheap souvenirs. Many of the foreigner visitor as well as a lot of Chinese tourists would like to purchase some memos and bargains to bring back home.